Scopus is pleased to announce a new feature that will show users the Mendeley readership statistics of a specific article. 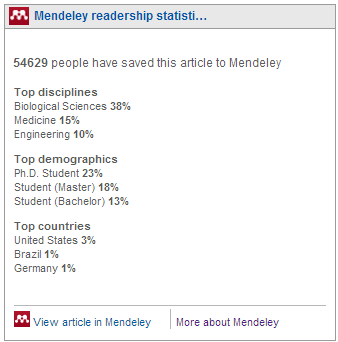 The beta version of Mendeley readership statistics went live on March 7, 2014. This new feature shows how many times Mendeley users have downloaded a specific article to their libraries. Additionally, it also shows a demographic breakdown by discipline, academic status and country of origin. These statistics appear on the Scopus Documents Details pages for which at least one Mendeley user has saved the document in their collection – if no one has saved it, the feature will not appear to Scopus users (similar to how Altmetric for Scopus works). When it does show, there is a link out to view the record on Mendeley.